look and actually tastes great? Kids will jump right in on the theme and will head out the door with a little less room for overindulging in candy. The secret about pesto is that it can be used in many ways. This recipe is inexpensive to make, and it is nut free. It results in enough for pizzas for the kids and grilled pasta and chicken for the adults, with more to spare. For the pesto: Put all the ingredients in a blender and puree. The consistency of the pesto can be adjusted by adding arugula to make it thicker or oil to make it thinner. For the pizza: Coat the entire top of the crust with pesto. Spread the cheese on top of the sauce and bake at about 450° F for 7 minutes or follow the pizza- crust-package directions. 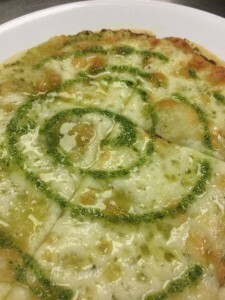 Top the finished pizza with a pesto drizzle just before serving. When placing pesto on pasta, it’s important to allow the pasta to cool a bit first and to wait to assemble the dish until about two minutes before serving. Otherwise the pesto will lose its bright green color and turn a dark, greenish brown. Combine the pesto and pasta in a large bowl. Place pasta portions on plates and top with slices of grilled chicken. Cook’s tip: I use pesto on everything—potatoes, pasta, eggs, bread and pizza. You can freeze any that’s unused. Serving size: Pesto Pizza serves 1; Pesto Pasta and Chicken serves 4. Pesto Nutrition Analysis: (serving size 2 tablespoons): 110 cal, 11 g fat, 0 mg chol, 90 mg sodium, 1 g carbs, 0 g fiber, 1 g sugar, 1 g protein. Slime Pizza Nutrition Analysis: 650 cal, 25 g fat, 60 mg chol,660 mg sodium, 84 g carbs, 11 g fiber, 9 g sugar, 18 g protein. Pesto Pasta & Chicken Nutrition Analysis: 590 cal, 28 g fat, 90 mg chol, 820 mg sodium, 48 g carbs,1 g fiber, 2 g sugar, 35 g protein. Laura Hahn, winner of Philadelphia’s 2012 NBC Next Local TV Chef competition, operates a restaurant consulting company and hosts her own cooking show on Ehow. She blogs about gluten-free food at GuiltFreeFoodieCutie.com. Copyright ©2019 Gluten-Free Living unless otherwise noted.